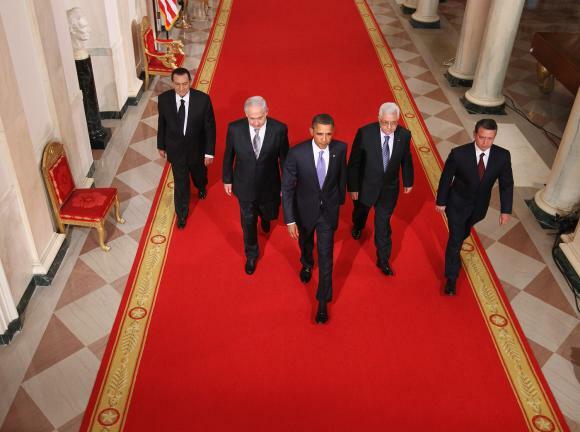 During recent Middle East Peace Talks in Washington D.C., this photograph was taken as the leaders of five countries walk toward the East Room. Left to right they are Egyptian President Hosni Mubarak, Israeli Prime Minister Benjamin Netanyahu, U.S. President Barack Obama, Palestinian Authority President Mahmoud Abbas, and King Abdullah II of Jordan. President Obama is walking at the front of this group. While they are all leaders, the United States is the organizing and host country. The other leaders are not subordinates in in the classic sense, but on the World Stage they are viewed as such in this context. Subordinates walk in front of their leaders at their own risk. If a group of employees is walking with their boss down the hall way, they walk in front of him at their own risk. It will be considered an affront and doing so puts their job at risk.